Safety is the most important part of every construction site. From heavy machinery, to demolition, to heights, there are a number of dangers on any construction project. That’s why it is the contractor's number one priority to keep everyone safe while they are on site. 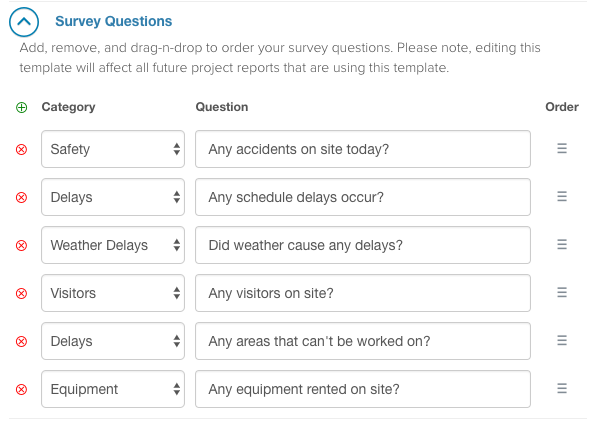 To help with this, contractors use the daily survey feature of Raken to create and complete a construction safety checklist. From this, Raken automatically generates a construction safety report so contractors can make sure their sites are safe, any dangers are identified, and injuries are reported so they can continue to improve the safety of the workers on site. This is just one additional benefit of using Raken to create your daily reports. According to OSHA, 23% of private sector work related deaths occurred in the construction industry. In fact, in recent years, the number of work-related injuries has been on the rise due to the boom of the construction industry, the decrease in inspections, and companies cutting corners to alleviate mounting competitive costs. Consistently using a daily construction safety checklist and creating a construction safety report is the first step towards protecting you and your workers. A construction safety checklist is a list of questions that you answer on a daily basis to assess the safety of your construction site. Safety checklists for construction typically contain a few standard questions but are customizable to fit the needs of your business. For example, if you are an electrician, your checklist can be used to ask there were any exposed wires or reported leaky batteries that day. 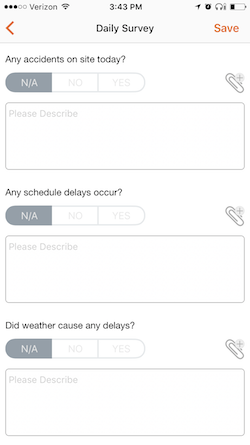 Users of Raken can use their daily survey feature to create a custom safety checklist that fits their needs. To edit the survey questions, simply navigate to the Company > Project Templates tab on the Raken Dashboard. The following are example questions you can include in your daily safety checklist. Did any accidents occur onsite? Were there any unusual events onsite? Are there any injuries to report? Did anyone return to work from an injury? Did you perform safety orientation for new subcontractors today? Did you complete an AHA form? Were there any safety complaints? Did you notice any hard hat or safety protection infractions? Mobility: Using an app means that you can complete safety checklists anywhere throughout the day. No longer rely on aggregating mental or hand written notes you made throughout the day. Notifications: Get daily reminders when it is time to complete your safety checklist. Raken lets you customize when we send you a push notification. 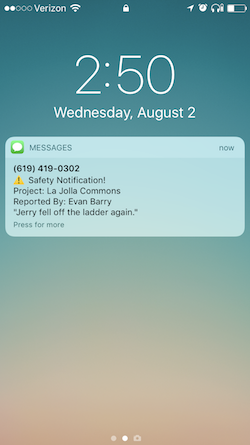 You also can get notified immediately if someone else includes a safety incident in their daily report. Sharing: Once your daily report is complete using Raken, it will automatically be shared with the members of your team that need to see it. Images: Easily add images to your safety checklist to let others see what that downed wire or spill looked like. What’s a Construction Safety Report? The information from your daily safety reports should be aggregated into a construction safety report. A construction safety report allows you see the trends of your project and get a high-level view of issues on your site. It utilizes visuals to give you a snapshot of everything you need to know, while also providing the granularity you need to make improvements on your site. Raken automatically generates safety reports based on the inputs from your safety checklist. 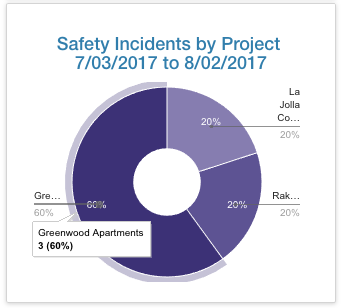 Graphs on the Raken dashboard give you a high-level view of the number of safety incidents you’ve had across all of your projects in a given timeframe. By clicking on the project you can see a monthly calendar with the number of incidents you’ve had for that project. You can click into any of these incidents to get a granular view of what happened that day. You can also get a real-time notification when incidents are reported on any of your projects so you are aware of them and take action immediately if necessary. 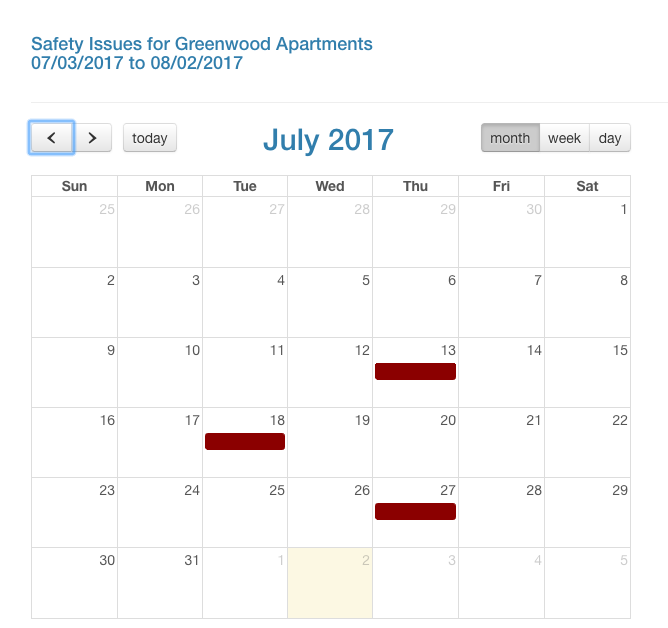 Now, when you and your team members complete the daily report, all safety questions will be automatically aggregated into a safety report. Need other forms of documentation? Use Raken's in-app construction photo feature to capture in image of that occured on the jobiste. As long as you’re consistent with completing your daily safety checklist, your safety report on the Raken dashboard will tell you everything you need to know. Ready to take your site safety to a new level? Try Raken today!